It is a matter of serious concern that pupils growing up in poverty have a much lower change of school success. Child poverty is widespread in Britain, approaching 1 in 3, and international tests such as PISA have demonstrated that the relative impact of poverty on school achievement is also high. Given the Coalition government’s programme of reducing benefits, it may appear hypocritical for one of its ministers to focus on the low achievement of disadvantaged pupils. However, when statistics were released in January, schools minister Nick Gibb complained that only 33.9% of disadvantaged pupils achieved five A*-C grad GCSEs with English and maths, compared to the national average of 58.2 per cent for all pupils in maintained schools. His speech blamed teachers and schools, neglecting to consider the possible impact of poverty and of government policies on the morale of young people. He also failed to point out that the gap between GCSE performance of disadvantaged pupils and that of all pupils has been roughly similar for many years. In support of his argument, he pointed out that in 21 schools in England, 80% of disadvantaged pupils gained 5A*-Cs including English and Maths. It turns out that half of them were selective schools which only accepted ‘disadvantaged’ pupils if they were high achievers at age 11. Another quarter were comprehensive schools, but with a pupil population heavily weighted towards the most able (based on primary school performance). This left only six, all small schools, and three of them selecting on grounds of religious practice (RC, Sikh and Muslim). 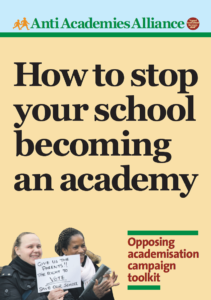 Firstly, it should not be assumed that all academies have large numbers of disadvantaged pupils. Nationally, around 15% of secondary school pupils are entitled to free school meals. (In addition, ‘disadvantaged pupils’ includes cared for pupils.) 72 out of 269 academies with 2011 results have fewer than 15% ‘disadvantaged pupils’. 48 have 10% or less, including converted grammar schools and other selective schools. Around half of all academies with 2011 results did worse than the national average in terms of the achievement of their disadvantaged pupils, and many more would have fallen below this proportion if they hadn’t made extensive use of the “equivalent” qualifications that the government is about to abolish as suspect. Of these 269 academies with 2011 results, 145 have less than the 33.9% [national average] of disadvantaged pupils gaining 5A-Cs with English and Maths or equivalent. 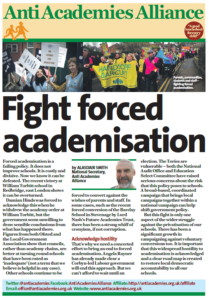 In other words, over half of academies produce worse results for disadvantaged pupils than the national average. 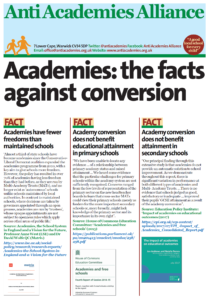 However, academies rely extensively on ‘equivalent’ qualifications to boost their 5A-C scores. (See research note on Equivalents for further explanation.) One measure of how much academies rely on equivalents is the gap between 5A-Cs with English and Maths including ‘equivalents’ and using GCSEs alone. The average gap for all maintained schools is 6 percentage points. 183 out of 269 have more than this standard gap, and 141 have more than a 10 percentage point gap. Using this last figure, we find that only 61 academies out of 269 match or exceed national average results for disadvantaged pupils without excessive use of ‘equivalents’. Nearly half of these, however, are selective schools converted from former grammar schools, independents or CTCs. These schools do not even admit disadvantaged pupils unless they are already proven high-fliers by age 11. It seems that only 1 in 10 academies can genuinely claim to be achieving even quite good results for disadvantaged pupils. This entry was posted in Academy watch, Research and tagged GCSE, Statistics. Bookmark the permalink.